Hard Work Pays Off With Up to 100 Free Builder Beaver Spins! 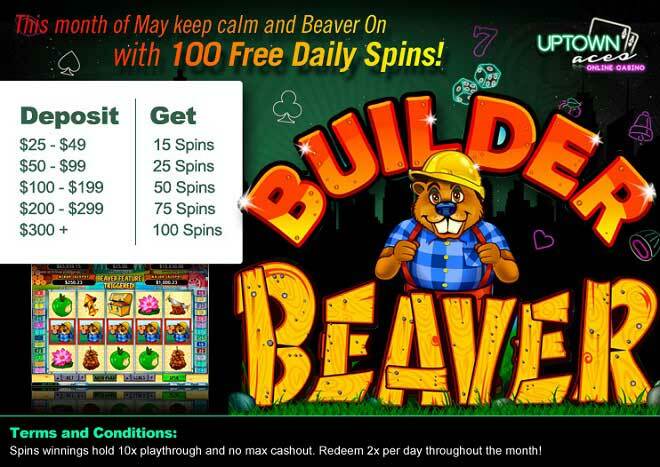 Make May a relaxing time and let the beavers do all the work when you deposit as little as $25 and get to play with up to 100 Free Builder Beaver Spins! The scatter Builder Beaver symbol launches free spins with a special multiplier. The original scatter keep adding free spins to the pot and also acts as an additional wild card for the duration of the bonus feature. Additional wilds and free spins occur throughout your Builder Beaver play! Sink your teeth deep into wins this May when you deposit a minimum of $25 to play with up to 100 Extra Spins!